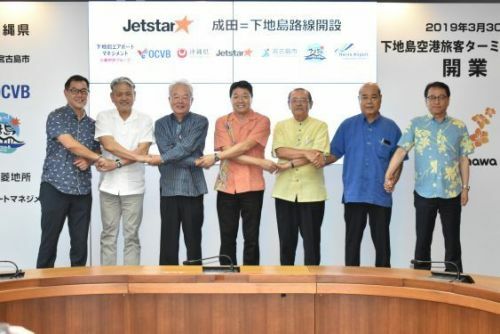 Okinawa Prefecture, who along with Mitsubishi Estate Co., Ltd. and Miyakojima City have been working to renovate the passenger terminal facilities at Shimoji-shima Airport, held a press conference October 15 at the Okinawa Prefectural Office, where they announced that the terminal will open March 30, 2019. Jetstar Japan has also announced their decision to have a scheduled flight from Narita Airport to Shimoji-shima Airport one a day starting next spring. There is also a plan to eventually increase flights to both the Kyushu and Kansai regions. There is also work done to realize international routes to places such as Taiwan, Hong Kong, and Korea as well as chartered flights, and the hope is to establish these routes by opening day. The goal is to establish three domestic and three international routes. They are also planning on making it possible for private jets to use the airport. Jetstar will fly a 180-passenger capacity Airbus A320 out of the reopened airport. The goal for the terminal is to make it capable of servicing 110,000 people in 2019, and increase that to 570,000 people per year by 2025. Miyakojima only has 1,000 rooms of tourist accommodations, but plan to increase that number by 3,300 rooms in 2019. The facilities employ 10 people currently, and will hire 20 people locally by the opening next year.